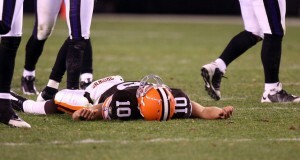 Browns quarterback Brady Quinn has been fined by the NFL for his chop block on Baltimore’s Terrell Suggs. A league source tells ESPN’s Michael Smith that an MRI exam showed Suggs suffered a severe MCL sprain from Quinn’s chop block on Monday night. There is no definitive timetable for Suggs’ return, but he is expected to miss at least the next couple weeks, the source said. Quinn said he received a letter from the league on Wednesday but would not disclose the size of his fine, saying only that it was “a good amount.” Quinn insists he was not trying to hurt Suggs and has apologized to him and the Ravens. The Ravens were fuming over the hit, during the Ravens’ 16-0 win on Monday night, as it could cost Suggs significant playing time while Baltimore attempts to remain in playoff contention. IMHO, the Ravens are justified in being angry about Quinn’s block. It was a chop block and he deserves to be fined for it. I think you will agree with me when I say- This has been a flat out awful year for the Cleveland Browns.